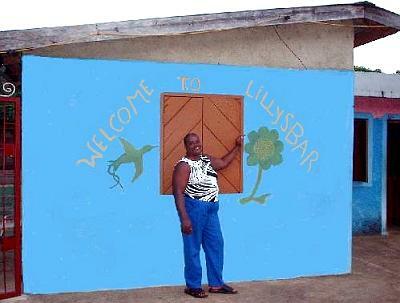 Miss Lilly Bolt's Bar and Shop is located in Coxheath on the northern edge of Jamaica's Cockpit Country. Lillian Bolt, the Auntie of Usain Bolt, "Lightning Bolt Usain", the world's fastest man, is well known for her hospitality, and for the fine times found at her wonderful bar. The shop serves not only the people of the district, but also visitors to Jamaica's famous Windsor Great Cave. Miss Lilly's shop is located on the Sherwood Content to Windsor road and is the last place to buy provisions before you venture into the wild hills of the central Cockpit Country. The surrounding scenary is best described as spectacular. To the Northeast rises the great wall of MacBean's Rock, a superb example of Tower Karst. To the Southeast, the rough track of the Peru Mountain road runs deep into the Cockpit. In the evening, the southern stars lie sparkling in a dark sky, high over the hills and valleys of the blessed Cockpit Country. By day, or by night, Miss Lilly's is the most friendly, comfortable, and beautiful place in the district. In addition to being a place to do your shopping, or have a cold beverage, Miss Lillian Bolt's shop will provide you with your best opportunity to get to know the culture and people of the surrounding district. Gideon (Usain's dad), Pim-pim, Malibu, Bigga, Ripton, Tony, Tumpa, One-foot Mellie, Usain Bolt, and many others will often drop by to pass the time. Roots and reggae is usually on the stereo in the evenings, and dancing, although not required, is certainly welcomed. Sherwood Content is reached by travelling the road from Falmouth, Trelawny, to Martha Brae, and then crossing the bridge to the east and turning right to follow the valley south into the hills. This scenic drive will take you along the side of the famous Martha Brae River, where tourists will be seen drifting downstream on bamboo rafts. "Rafting on the Martha Brae", is well known to visitors to the island. You will pass through the small farming communities of Perth Town and Reserve after you've parted ways with the river, then through Sherwood Content, and finally to Coxheath. The nearby villages of Fontabelle, Friendship, Bunkers Hill and Duanville are neighbours to Sherwood Content and Coxheath, and many evenings you can expect to meet people from these places who have also come to enjoy Miss Lilly's hospitality. People of the district, and the neighbouring districts, and from lands thousands of miles away eventually find their way to Lilly's and it's hoped you will too. As part of the JCO, Miss Lillian Bolt has supplied valuable ground support for our caving activities. 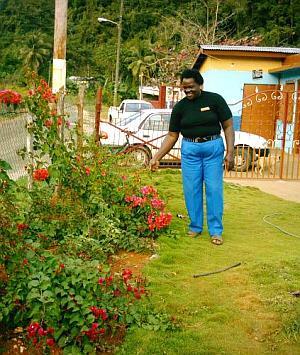 On Feb 4, 2004, Lilly was instrumental in helping is to carry out the Hutchinson's Hole work done for the Jamaica Constabulary Force. Her assistance in keeping the crowd under control made all the difference. On Jun 13, 2004, she was once again one of the most important members of the surface crew on our descent of the 160 m deep Volcano Hole. In addition to being part of the caving team, she is the Secretary of the JCO, on the Council, and a source of guidance and strength to the entire group. The JCO would like to thank Miss Lillian Bolt for her great support and assistance through the years. She has been instrumental in helping us to advance the mission, and has kept us on course. The JCO is proud to have Lilly Bolt as one of our crew, and we strongly suggest that you visit her shop, get to know her, and spend a few dollars. When en route to Windsor, or if you just feel like taking a drive to the most beautiful part of the Cockpit Country, pay a visit to Miss Lilly's. You'll be glad you did. A big up to Usain Bolt and all the best at the 2008 Olympics. Show them what you can do, bredren. 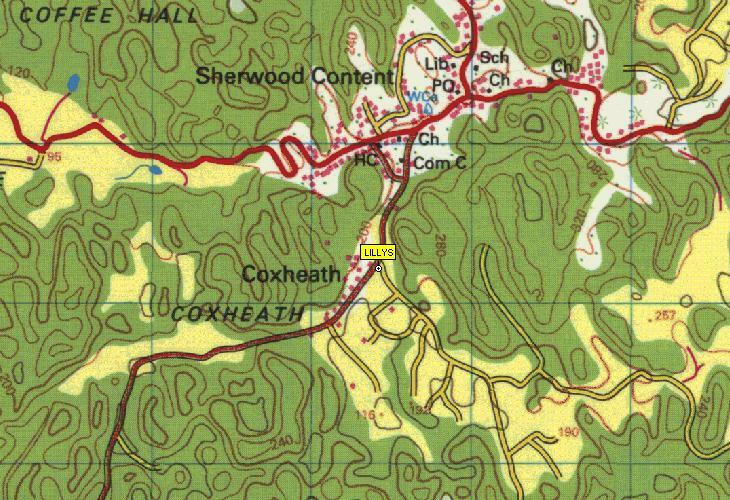 Many thanks to The National Land Agency of Jamaica for the use of the topo maps on this site.